Nite Site Eagle Night Vision. The Eagle is for the hunter who wants a product without limitations. Much like nature’s eagle, this NiteSite will spot and identify quarry so far away it almost seems unfair. It achieves this using five powerful infrared illuminators (invisible to people and animals) to literally illuminate the target area immediately in front of where the rifle scope is aiming, allowing clear target identification up to 500 metres (550 yards) away. The infrared image is then captured through the rifle scope by a compact digital camera unit attached to the scope’s eyepiece and then played back live to the hunter via the unit’s integral 3.5 inch LCD screen. A video out jack enables recording of all night hunting activities. Like all NiteSite products, the Viper utilises infrared illumination in a unique way, making it more affordable, reliable and user friendly than traditional light amplification technologies, delivering crisp, ultra-clear night vision, regardless of ambient light conditions. The true beauty of a NiteSite is that it converts any day scope (there’s no need to remove it) into a powerful night vision system that is quick and simple to set up. Indeed, from opening the carry case to hunt ready status takes just 60 seconds once you are familiar with the set up. All NiteSites are equipped with adaptable fittings that enable mounting onto virtually any make and size of scope and there is no need to re zero or adjust your scope in any way. Just mount the unit, switch on and you’re ready to shoot. Simple as that. The Viper is available as standard with a small lightweight scope mounted 1.5Ah battery that delivers a run time of up to 7.5 hours. Spare batteries are also available in our accessory range. The scope mounted module houses three powerful (IR) illuminator delivering a range of up to 100m. An ergonomic ‘dimming’ knob allows accurate control of the illumination power to reduce flare for closer range targeting. The hooded front has an inset protective lens cover. 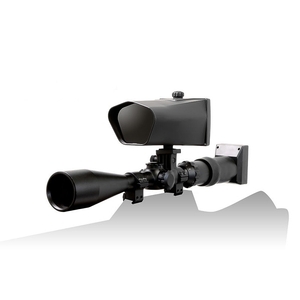 Your IR illuminated targets are viewed through a high-resolution 3.5 inch LCD screen that delivers a clear black and white image of the view through the rifle scope. To prevent the illuminator moving out of the mount the anti-recoil clamp holds the unit firmly and securely to the “T” mount in conjunction with the scope clamp. The scope clamp is used to attach the illuminator module to the rifle scope body tube. Its flexible construction allows easy clip on attachment to the scope. A rubber sleeve provides a secure, stable connection from the scope’s ocular to the camera unit. The heavy-duty rubber construction is flexible enough to stretch over most rifle scope eyepieces. The rugged module houses an infrared (IR) frequency camera with audio and video (AV) output allowing external connection to a recording device via a 3.5mm four pin socket. A large push button on/off switch is located on the rear face of the module for easy night operation. The 1.5Ah lithium-ion polymer scope mounted battery provides 7.5 hours operating time and has an adjustable Velcro strap for easy fastening to your rifle scope.